Quality Control does not exist in WG. you should know that by now. I always liked Admiral Hipper but after this uptdate she feels to be even better. How is it that i can't use my repair party?? Noticed flag and module upgrades show bonuses in green and penalties in red. edit: And the markings of special skills on commanders of course. Except for Jack's SS expert skill apparantly. Nicely done WG now u brought stealth firing again!! 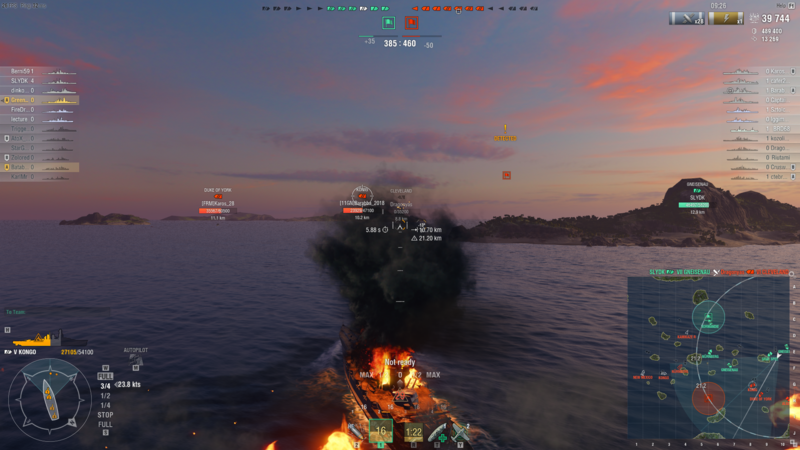 I do like the new penalty system but there are a few things I am not happy with about it, one is that you are penalised for someone ramming you, yesterday I got deliberately rammed out of a cap zone so someone would get the credit for taking it, I was in an Atago and they were in a currywurzt, I couldn't get out of the way as he caught me side on, I now have 49 penalty points due to being rammed for over 3km out of a cap zone when it wasn't my fault, there needs to be an algorithm to distinguish between a deliberate ram of a stationary ship and accidental collisions as this is going to affect the most careful of players, also being penalised for client crashes like my husband was yesterday, not a good way to go about treating players for the games client instability! I agree. Of course, the information has always been there, but now the pros and cons are colour coded, making the choice much easier. I would argue that 49 (damage?) are not really much and how do you get rammed for like 3 km? Dont you just accelerate and go forward? I dont think that there will an algorithm for that ever, so there is the option to write at ticket for that. The two are most likely closely related. It's a known bug - if you lose connection and re-log, the counters on your consumables are often messed up if they were running or on cooldown. The issue you've experienced is most likely that the repair party actually is still on cooldown - only your client doesn't display the counter properly. Yes, it can be annoying and screw you over big time (imagine a DD player after re-load that has to guess whether the smoke has come back already or not - or, worse, doesn't realize that UI is untrustworthy and THINKS he has a smoke while he really doesn't). Spotted ships takes up to 20 seconds to render in, in general, not always though. Spotted ships not rendering in for that long aren't the matter of the WG delay - more like a combination of stronk programming and playing on a toaster. Different capabilities of computers are the driving reason for the hard-coded delay (so that mutually spotting ships don't see each other at different moment depending on how good is both players' hardware) but this only covers small delays. If your computer is struggling, you can get a looooong delay. Also, one more thing: currently there's a bug that can make it SEEM like there's a delay while in fact a ship is simply not spotted. If a ship "blinks" (gets very briefly spotted and then disappears) it's position on the map is displayed as red outline... and does NOT go back to grey outline (last position) despite the ship NOT being currently spotted. The result looks like a stationary ship that's spotted but refuses to render, while in reality the thing might well be somewhere else entirely. My PC: Win10 64bit, Intel Core i7 6700K, 32GB RAM, Asus Maximus VIII GENE motherboard, NVIDIA GeForce GTX 1070, Samsung SSD 840 EVO 250GB (game installed here) and a 120/10 Mbit internet connection. The issue is not with the bug you describe, it is with ships, within spotting range, not getting rendered in for long periods after shooting and not hidden by smoke or other means. Turning all setting to lowest possible, doesn't change the rendiring time of ships, so apparently, it is not a graphical issue, but a connection issue. Playing other games that are even heavier on both graphics and connection, doesn't have this problem, so it must be on WG's side. All due respect but all this "quality" rhetoric rings a bit hollow when at the same time you roll out broken Asashio as-is. EDIT and WHY nerf HMS Orion via the Sigma? THAT was not why she was OP! And then of course there is the exemption of the new misconduct sanctioning system for aircraft carriers that rewards them for not moving. Warthunder is open for open Beta application. Just saying. 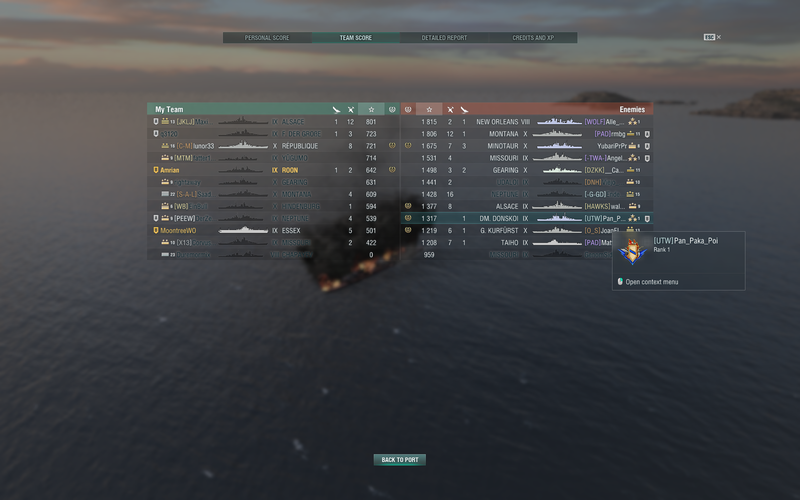 Oh no, your 7s got placed into a tier 9 game? How horrible! How are you supposed to stomp those 2-tiers-belwo-you 5s when you are fighting 9s?!?!?! PLEASE FIX ASAP!!!!!11! How frikin' hard is it to understand something as simple as that? WHY nerf HMS Orion via the Sigma? Slight reduction in overall accuracy, especially vs smaller ships. Quite obvious, isn't it? Yo know what Wargayming? You have "improved" (like always) scenarios mode making them harder, but you know why people oven playing this mode? TO CHILL OUT AFTER IDIOCY OF A "TEAMPLAY" YOU ARE ALLOWING IN RANDOMS AND RANKED!!! Nobody wan't this mode harder to play, people wan't to gather some credits, make up a ship or commander in a premium vessel , gather some XP on the way and finally have some FUN. GO TO HELL WITH THAT UPDATE!!! PS: you won't see a broken penny from me anymore spent on your "games" (which is btw a fvking disgrace to ask a price of a full game for a in-game content). you can ask your uncle Putin for a donation. Bye svckers!!!! Changes to the map "Shatter" are bad and make it far more stale. Southern spawn seems to have a major advantage thanks to the placement of the 2 little islands east of the C cap. It is now possible to lock down the entire eastern part with cruisers that have high shell arcs by just placing them there, even more so if they have radar/ hydro or both ( Des Moines, Mino, Balti etc). It has become basically impossible to push them sitting in these positions. As a general trend of reworked maps, torping has also become significantly more difficult due to the island placement. The positions I just mentioned in particular are borderline impossible for DDs to get around and other ships pushing that location from the north end up in a cross fire from ppl sitting at those islands and those behind the big island at C. The intention seems to have been to make that map more "brawly" but it actually has made it far more stale, further reducing tactical options with the south having a big advantage now. Please , Please, Please give us the old division window back. Current version is PANTS ! I like the German Attack challenge because you can do it at any Tier. Probably not many people will do it this way since it is dull and more time-consuming than I anticipated. And (EDIT) that's a good thing, too, because in contrast to what the wording says, you DON'T get those 2K XP "per battle", only once. For one battle - the last one.) But then again you're dealing with a fair number of nerds here and that kind of people don't really need more of a reason than "because they can". The drawback is of course that gaming this challenge in the described manner blocks the player from working on any of the other challenges and Combat Missions except "German Attack", Missing out on rewards that would also be fairly interesting. One note regarding the "Bismarck in Action" challenge would be that while the requirements state you can do this in "Random, Ranked, Co-Op or Scenario Battle", there are no Scenario operations for Tier VIII ships as far as I know, are there? 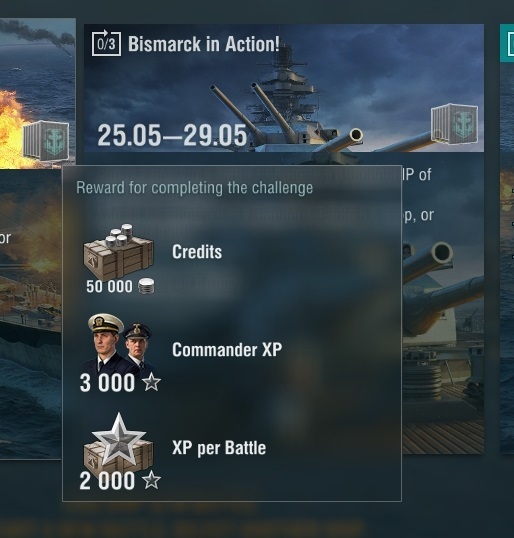 EDIT: I don't know about the 2K XP incentive for the "Bismarck in Action" challenge. To me, it's not very incentivising since I have no interest in acquiring any higher tier German BB. To any Bismarck owner who has already unlocked the Tier IX German BB, as well as every Tirpitz owner, it's just more frozen XP. Edit2: A "Hunt for the Bismarck" container would have been a better incentive since this would also incentivise Bismarck owners out for the premium camos, as well as everyone out for special flags (which is pretty much everyone). I mean come on, I' just missing one more Item and I got 37! duplicates in the Bismarck collection so far. It was only clear for those who had come across that format before. They can know this from context. I had not (or could not remember it) and therefore could not. I still have no idea where you pulled that "per battle" out of, I'm sure you can imagine my best guess for it. Clue: "your" + synonym to "donkey"
And quite clearly you have to do some stuff in one battle & you can do it 3 times. So every time you complete those requirements you get 2k xp - for each of them, not after just once doing the mission 3 times. It comes up when you hover your mouse cursor over the wee container icon in the challenge description. As per usual. Very simple. Anyway, I just had... what's the word - epiphany? - about what that is. What do you "usually" have written there? "Free XP" / "Elite XP". Would it be possible to add a phase to the matchmaker where it switches around players based on their pvp rank or other skill metric? I'm getting a bit of a streak of very hard games lately where the enemy team has much higher rank players than ours and predictably our team just gets steam rolled. I understand that this will randomly happen but in cases where one team has multiple rank 1 people (in different teams) and other has none, it gets doubly frustrating. The matchmaker could have put half of the high ranked players into the other team very easily, but instead it gave us this boring impossible match. I have included a screen shot of a particularly nasty case I had just now where enemy team had four rank 1:s including a cv player and highest in our team was rank 6.